This is one of those weeks that just seems to be flying by without me getting done all the things I am trying to get done. I can’t believe it is already Wednesday! I got the WORST sunburn at the beach this past weekend (and I wore sunscreen, I swear!) so this week has been a struggle just to move around (it hurts to walk and to sit) which is definitely slowing down my “to do” list. Hope you enjoy this week’s Wednesday Wants. I am apparently really loving summer accessories at the moment… and that pineapple & flamingo addiction I’ve had is apparently still going strong. See you back here on Friday, thanks for reading! "E-Shakti Review & Store Gift Cards!" "High Five for Friday #4"
So so sorry about your sunburn! 🙁 I do love your picks especially the pineapple case and earrings!! Happy Wednesday lovely!! Aw thank you! It is FINALLY starting to fade to a tan – phew! Thanks so much, I am glad you like them! Thanks so much for stopping by!! Oh my, these tassel earrings are stunning and so fun!! I need them haha. I have that fan necklace too, really love it. So perfect for summer!! Aren't they!?! I love them! I am so into summer accessories right now!! Those phone cases are so cute! I have the flamingo one on my wish list. Those earrings are adorable too! Aren't they!?! So fun for summer! Obsessed with both of those phone cases! I love those phone cases…how fun!! And I have a skirt kind like the BR one. I got it from H&M last year and have worn it so much. Great summer picks! And ahh nice!! ya, it seems like it would be such a versatile piece- easy to dress up for work, but would also look good with a white tee and denim jacket! Those phone cases are adorable! And I love those pink tassel earrings! Those pink tassel earrings are amazing! Loving the tassel trend! Ah aren't they!? They ran out of stock before I could get them and i'm dying for them to come back in! 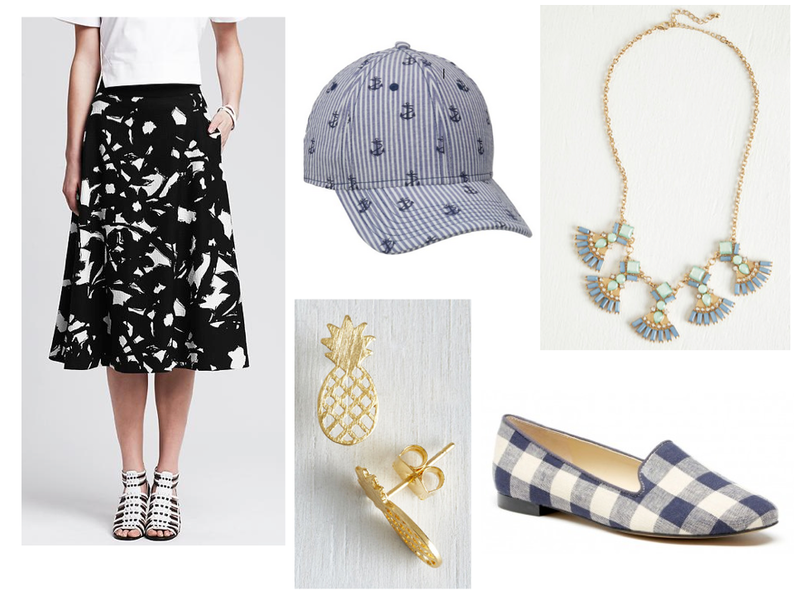 Loooooove those little pineapple earrings and the black/white midi skirt!